'Seeking for gold - cradling' is a heroic depiction of the Australian worker and landscape. 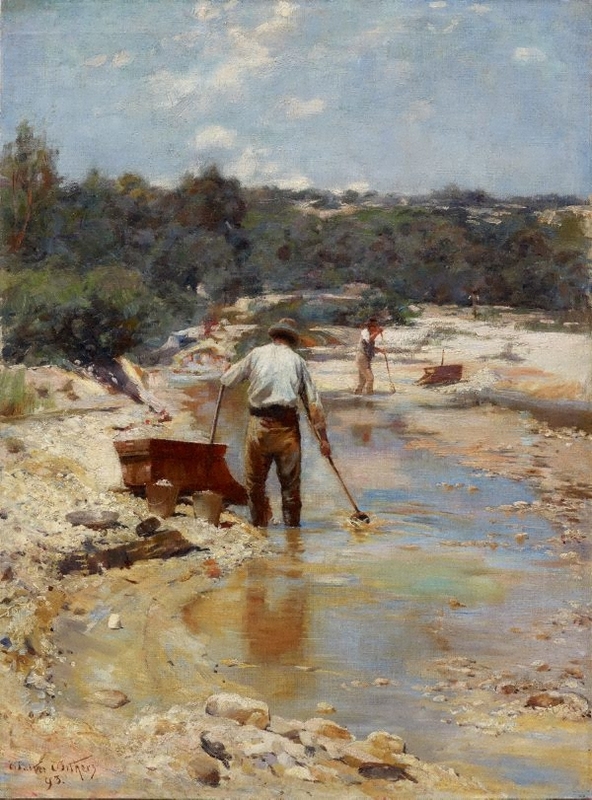 It presents two men fossicking for gold in a stream, saturated in brilliant sunlight. Each man is using a gold cradle - a box on inclined rockers containing metal sieves, which was moved by hand to process soil, capturing gold in the base of the cradle. After arriving in Melbourne in 1883, English-born Walter Withers continued his studies at the National Gallery School. He became a central member of the Heidelberg group of artists and was a strong advocate of plein-air painting. In January 1893 Withers held outdoor painting classes in the gold mining town of Creswick, Victoria. Here he painted landscape and mining subjects including 'Seeking for gold - cradling', demonstrating his affinity with the Australian landscape. Other related works by Withers are held in the National Gallery of Australia and the City of Ballarat Fine Art Gallery. Signed and dated l.l., brown oil "Walter Withers/ 93". Victorian Artists Society (Compilator), Victorian Artists' Society April exhibition 1893 , Melbourne, Apr 1893, 8, 9 (illus.). titled 'Seeking for Gold - Cradling'; cat.no. 6; priced 20 guineas (illustration is a line engraving).